We are excited for our upcoming Truck Show! 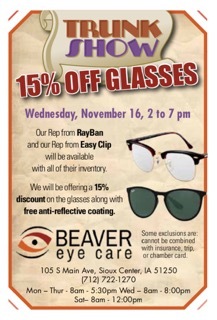 We will have 15% off glasses and our RayBan and Easy Clip reps will be here with all of their inventory! Head to our office Wednesday, November 16 from 2pm to 7pm. We will be offering a 15% discount on the glasses along with free anti-reflective coating!